Due to necessary maintenance, the pool will now open on June 17. 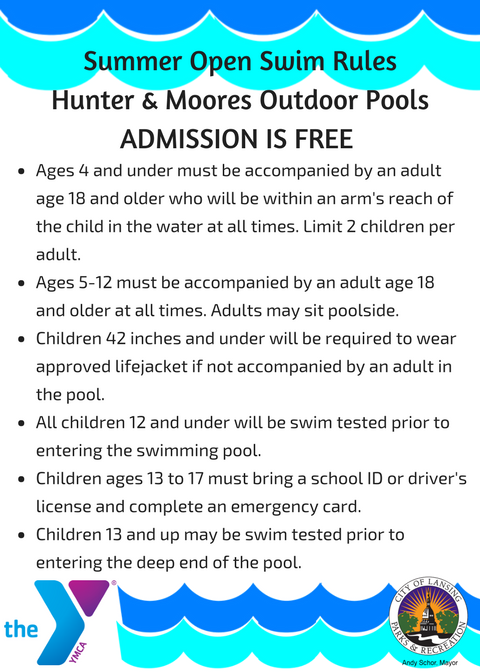 It is FREE admission and has open swim from 1-4pm and 5-8pm seven days a week, beginning June 17 and running until August 19. It is open to resident and non-residents of Lansing. There are showers and lockers available. The YMCA is also staffing the pool again this year. Please be aware of the open swim rules posted here. The pool phone is 517-371-2778 and you can call to check if it’s open during the listed hours. It’s located in Moores Park, behind the old Moores Park Elementary School at 600 Moores Park Dr, Lansing, MI 48910. The complete pool information is in the Lansing Living Summer 2018 publication.